Medicine is a mess with many many parts- one is death and dying which affects everyone from the highest echelon doctors to the lowliest patients. Doctors are trained in how to keep patients alive and with all the new technology, they can can certainly do that for extended periods during which time more and more surgeries and procedures and medicines are used hoping to make a big difference – but they’ll really make only a 10% difference. The sole purpose for hospitals is to keep patients alive – a given minimum. But are there no limits? Just because we “can” keep them “alive,” is that for the best? And how should doctors and patients and care-givers address this issue? When limits are set, can they be accommodated? Can the institutions or personnel we have now be trained to let people die? Or better yet, to live the most unencumbered life possible for as long as possible? Traditionally the family has cared for the dying in a real home and let them die appropriately when it was time. In recent history, the common death occurs in a hospital when someone has finally refused treatment or succumbed in spite of it. But in the past few years, more and more people have been choosing to go home and allow hospice to assist in the death. Why is it done this way? The truth is we just don’t want to admit that we are going to die – don’t want to admit that the time has come. And doctors, who have been trained to keep people alive, are no different. Patients and their families don’t want to talk about it – we just want to be fixed. There comes a point when we are not going to be fixed – it’s terminal – even with modern medicine. To think otherwise is a delusion. 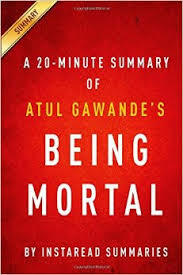 And in 8 chapters, that’s exactly what Gawande covers in this fascinating report on death and dying in 21st century America. For the most part the patients covered are elderly including the personal stories of the author’s mother-in-law and his father. But there are young people too, stricken with some terminal disease and having to make the decisions about what’s important to them – when recovery is not an option, how do they want to die. With the elderly the ideas of assisted living and nursing care are explored and found wanting. They were good ideas at the time but have been skewed into profit-oriented enterprises, with client safety coming in second place and virtually no place at all for individual preferences. My mom is 91 and I’m no healthy spring chicken – the subject is of great personal interest to me. Yes, of course we’ve had the conversations, but I really felt like I needed to know more and I’m very glad I read this helpful book. I didn’t realise you had read this book too until I saw it in your Best-of list. I read it when my mother was dying and it’s the only book that I haven’t reviewed on my blog since I started it. I just couldn’t, it was too personal for me at that time. It’s an incredibly hard situation to be in, LIsa. My heart goes out to you. My mom will be 92 this month and I’m the lone ranger for outside care but she’s not in the dying situation yet. She’s still in her own home – I don’t know for how much longer. The book really helped me to see that quality of life is as important as “safety.” She gets to die the way she wants to if I can do it – but as Gawande said, it doesn’t always happen that way – his own father had to stay in the hospital.